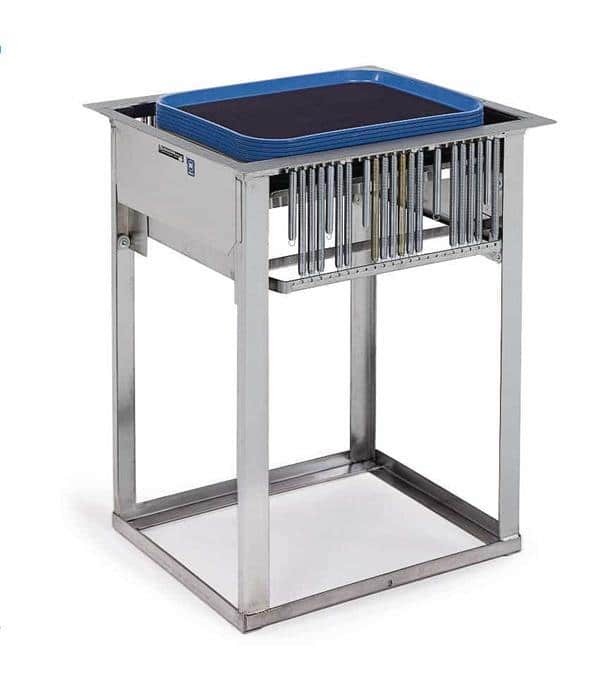 Provide Convenient Tray Dispensing with a Durable Stainless Steel Design. Easy-to-clean and sanitize stainless steel. All-welded stainless steel construction for long service life. Field adjustable without tools to assure proper ergonomic dispensing level. Shall be of all-welded stainless steel construction and shall accept trays or racks on a stainless steel spring-loaded, self-leveling carriage. Unit shall hang from counter cutout by a 14-gauge top flange, welded to unit frame. Carriage shall feature banks of tension springs on two sides. Spring tension for carriage shall be field adjustable without tools by hooking or unhooking springs to or from the carriage, providing proper dispensing level. Carriage shall also feature sets of nylon roller guides on all four corners to provide smooth leveling movement inside unit frame. Lower frame shall be of .120 x 1” x 1” stainless steel. Unit shall be NSF listed.